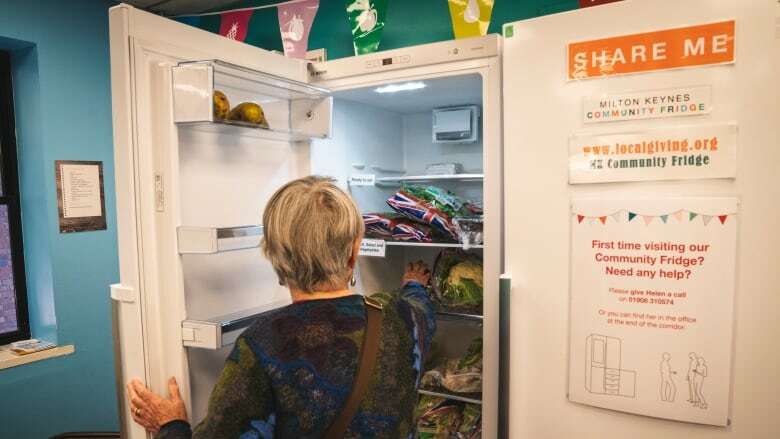 To combat food waste — and help ensure more people have access to nutritious food — a British environmental charity is turning to an innovative bit of technology: community refrigerators. Set up in public spaces including community centers and a church, the refrigerators allow restaurants, supermarkets, home cooks and others with excess food to donate it while helping ensure it remains fresh. Those in need of the food then can pick it up, free of charge. "Food waste is a major issue in the UK — about 13 billion pounds [5.9 million tonnes] worth of food gets wasted every year," said Stine Wilhelmsen, who works with Hubbub, the environmental charity installing the fridges. The charity, which has installed 50 community refrigerators so far, aims to put in place another 50 across Britain by the end of 2020, she said. The initiative is part of the charity's Community Fridge Network, launched in 2017 to tackle food waste by supporting groups trying to redistribute unused food, Wilhelmsen told the Thomson Reuters Foundation. "There are currently not that many solutions for redistributing perishable foods, such as bread, fruit and veg, which are also the most commonly wasted food items," she said. "Community fridges really offer a really nice solution to this problem." Users of one fridge at the Food Academy in east London, which aims to improve health through cooking and exercise workshops, said it had helped people who struggle with health issues such as diabetes and obesity access healthy food. "It's just brought the whole community together — there's more awareness about healthy eating as well because the food and veg that is donated to us is very healthy," said Manaza Nasa, a volunteer at the site. People "are getting to try new fruit and veg that they've not tried before, because fruit and veg is more expensive than junk food," she said. She said she became involved with the Food Academy because of her own struggles with weight, and a desire to better educate her children on healthy habits. On average, each community refrigerator site is visited by over 200 people a month — though that number can climb to about 1,000 visitors for busier locations, Wilhelmsen said. At the moment, the refrigerator network is helping redistribute 23 tonnes (25 tons) of food a month — or about 50,000 meals, she said. Over the course of the three months Nasa has volunteered at the Food Academy, she said she has seen a noticeable increase in the number of residents making use of the refrigerator, which has become a community gathering spot. "It's definitely becoming more popular," she said. "It brings (people) together. They come here to meet other people and it gets that spirit going, that sharing spirit." "We exchange recipes with each other, how to cook healthy — it's a lovely atmosphere."